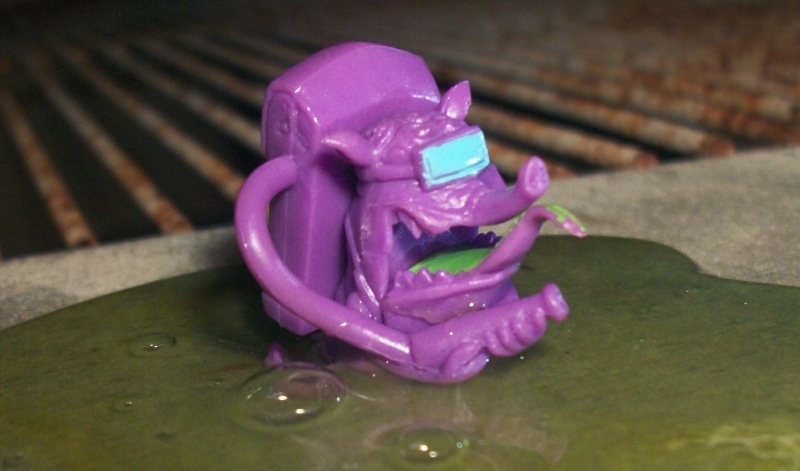 Weeks ago I introduced you to Slimy Sludge, the amazing new line of cheap mutant monster figures exclusively at Target. As we speak, I'm just one figure short of a complete set, and we have a dozen more to review, so here's the next four! This guy looks a lot like one of the major monsters from Q*Bert. His name was Ugg. He, too, was a roughly potato-shaped, purple, fanged pig-tapir with tiny feet. Ugg, however, didn't have any arms, so he couldn't carry around a giant backpack presumably filled with some sort of hazardous waste, probably in gaseous form. I can't imagine toxic gas would harm either Rot Zombies or Sludge Monsters, though. What are the zombies so heavily armed for? Who are they fighting? It's easy to presume these two teams are just arch rivals, but what if they're not? What if Rot Zombies protect gentle Sludge Monster communities from horrible, roving bands of human poachers who find Sludge Monster slime to be an addictive aphrodesiac, or something? Maybe they need it, because there aren't all that many humans left, but must one species suffer for another to thrive? You had your chance, humanity. Let it go. When I first looked over these characters, I thought Slimeyeti would be my least favorite, since he's kind of just a slimy ape in a line full of slimy mollusks and worms, but there are four things that make Slimeyeti a keeper. One, his face is hilarious, both in his package art and his actual sculpt. Two, he looks a lot like an emaciated, snot-covered Barney Gumble, which I believe is the second time this season that I've compared a monster of some sort to Barney Gumble. 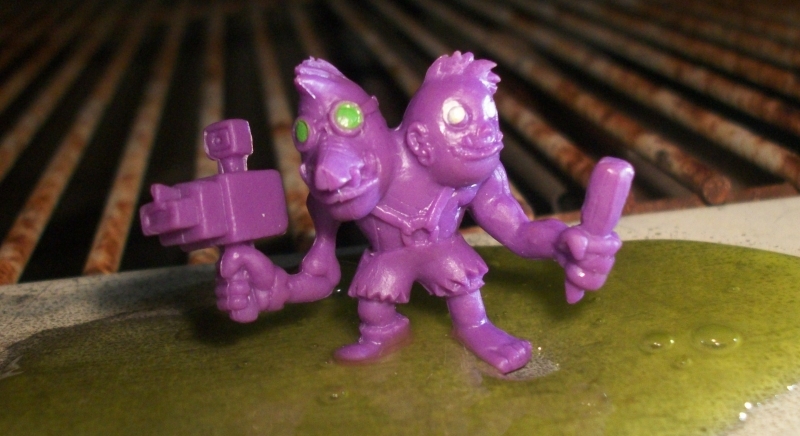 Three, Slimeyeti is a yeti of slime, which is two good things that don't make sense together, but should. 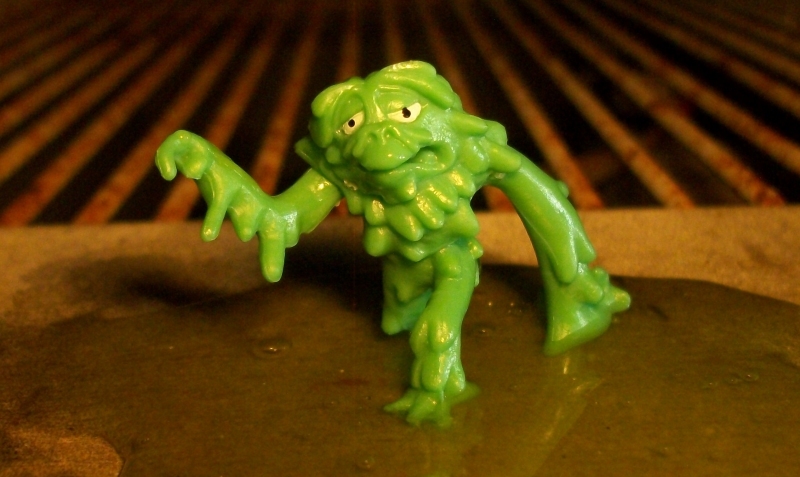 Finally, Slimeyeti was clearly designed to be doing the Bigfoot walk. You know the one. Yes, "2 Knuckleheads" is the name of this figure and presumably the only way you can address them. 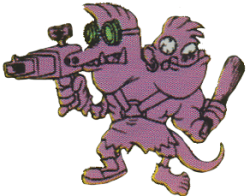 Their design perfectly communicates that one of the two is the "smart one" and cares a lot about his job, while the other one just hits things and probably screws everything up for his nerdier, more aardvark-like brother, but you know, that could always just be what they want you to think. The cross-eyed head with the club could be the tactical genius here, or maybe they're just both brilliant, but they put on a show of fighting with each other and go by a name like "2 Knuckleheads" so they can benefit from an element of surprise and take lurid photos of you with that obsolete camera they wield like a gun. Dastardly. 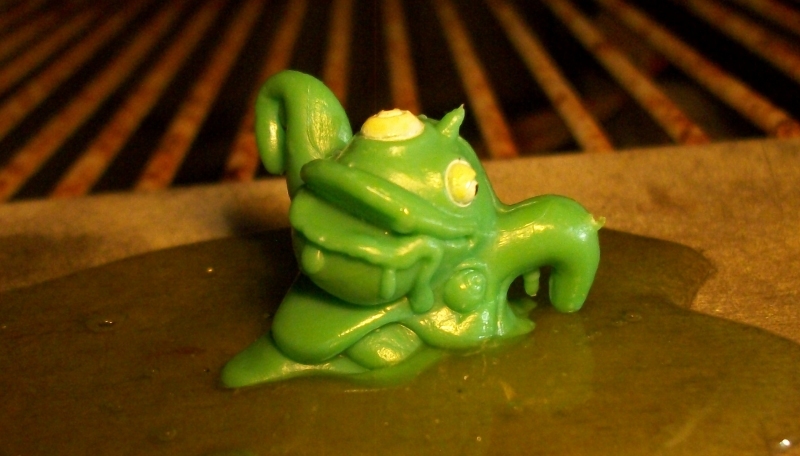 This one's name is "Slimy Blob," but aren't they all "slimy blobs?" 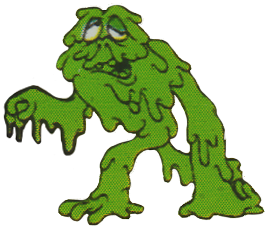 I suppose this particular Slimy Blob fits that description the best, basically the one Sludge Monster that appears to be just a pile of living goo, though still even more fun than that would usually entail. 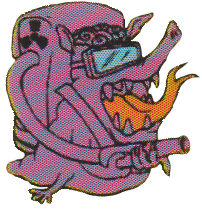 He's got a hilarious frog-like mouth, two tentacle arms, and bulging lizard eyeballs on only one side of his head, like a flounder. He's got an extra one lower down, too, that they just didn't bother to paint. 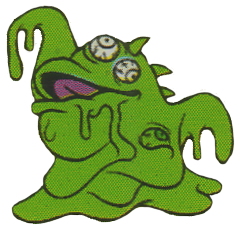 I am definitely in favor of tentacled flounder-frog slime heaps, and I have also decided that Slimy Blob speaks exactly like Homsar. If you don't know who that is or what he speaks like, I am revoking your internet.